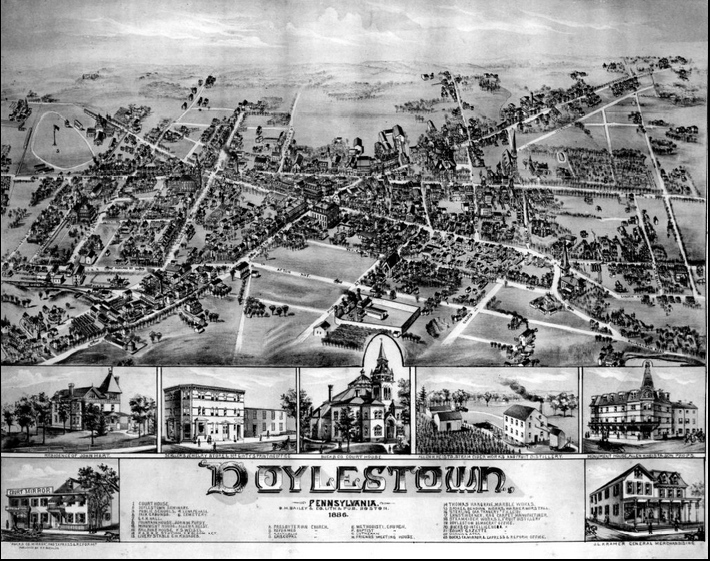 Check out this interactive map I put together of Doylestown from 1886. You zoom in to find familiar buildings or see places that have long since been destroyed. Some details I enjoyed were the old fair grounds on the top right, where CB West is now, the fact that the jail (now the Michener Museum) was pretty much in the middle of nowhere, and the road leading out of town called “Lumberville Road”, which I’m guessing is now Cold Spring Creamery. I also wonder what sort of booze they were cooking up at the fruit distillery. Oliver Paxson was a prominent member of the Religious Society of Friends, and was one of the first residents of New Hope. His home, known as Maple Grove, still stands in New Hope immediately to the east of the New Hope-Solebury school complex. He also operated a stable and a salt store, now Hearth restaurant around the corner from Farley’s Bookshop. In this letter, published in the first volume of Friends Miscellany (1831), Paxson considers the issue of settling land that has been expropriated from the Indians by force. Paxson presents a surprisingly nuanced and empathetic perspective on the conflict between Indians an European settlers. He believes that Indians own the land they lived on, and that Europeans who want to rightfully occupy that land must purchase it from the Indians on mutually agreeable terms. This stands in sharp contrast to the view of many of his contemporaries, who believed that Indians didn’t actually own the lived on because they didn’t use it properly (“wasting” it as hunting grounds, etc.) and that Europeans farmers were therefore justified in appropriating it. Paxson also believes that capturing land in war or compelling Indians to sell their land through force of arms does not bestow a legitimate right of ownership. When the government has taken Indian land by force Quakers still have an ethical obligation fairly compensate the rightful owners. Otherwise, they’re complicit in the theft of native property. He then cites the biblical precedent in the story of Naboth. In that story, the Jews had a different theory of land ownership than the Baalist king. Naboth owned his farm by right of inheritance, and was required by Jewish law to pass it on to his own heirs in turn. Ahab demanded to purchase it as one would purchase an alienable commodity. Because Naboth couldn’t sell his land, Ahab murdered him and stole it, and the prophet Elijah brought God’s wrath upon his family. Quakers, Paxson implied, should not go the way of Ahab. The letter probably dates to 1802. New Hope, 5th of 4th mo. I have had a share of thy kind remembrance, with many other friends in the place of thy nativity, which I have no doubt has been gladly received by all the friends thou hast written to; and I thought I felt under some obligation to answer thee. But alas! what shall I say? When I think of writing a letter of social friendship, there is a subject that more or less, for fifty years, hath exercised my mind, and greatly so, of latter times:–that is, the situation of the Indians, unto whom this great and populous country once belonged. Thou hast often heard and read of the wars in New England and Virginia, in conquests over them, and taking their lands. Not so, when William Penn came to Pennsylvania:–a man who had learned his Master’s lesson, “to do unto all men as he would they should do unto him.” This made his name honourable among the Indians, and it remains so to the present time. But after some time one of his successors, not keeping strictly to this rule, overreached them in a purchase in an extraordinary (or shall I say extravagant) day’s walk, and they revenged it many years afterward, when an opportunity offered, by killing and taking into captivity, many of the white inhabitants. Thou and I can remember these things. How our very ears were made to tingle! Well, time passed on, till the revolutionary war began. The poor Indians hardly knew what part to take, fearing they should lose all their country in the quarrel between nations of white people; especially if it should turn in favour of the United States (as it finally did) and some of the Seneca Chiefs addressed General Washington near the close of the war, made their submission, and remain peaceably on their reservations in the State of New York. What comes next to be considered is the state of the country thou livest in. About this time, the white people near the Ohio river went over and made settlements on their lands. They complained of their land and game being taken from them, and found no redress. At length they took up the hatchet, and skirmishing on both sides of the river ensued. The President by this time, thought it his duty to endeavour to put a stop to it, and appointed commissioners to treat of peace, and purchase their land. They met, divers Friends attending, viz. John Parrish, Joseph Moore, Jacob Lindley, and some others. The Indians appeared in a hostile, angry mood, and told the commissioners, they would sell them no land;–but required them to remove the white people that were already settled over the river. The treaty broke up, without doing any thing, and hostilities continued: in consequence of which, the President ordered an armed force to defend the frontiers, and bring the Indians to terms. Sinclair their general. About this time the Meeting for Sufferings was sitting, and a heavy exercise came over the meeting on this account, and a committee was appointed to wait on the President, to intreat him to stay the sword:–which they did in a solemn manner, but all in vain. The expedition was pursued. Sinclair defeated, and many fell in battle. But it did not stop here. A greater force was raised, and a general appointed, more skilful in fighting the Indians, and effectually subdued them; and many of the rightful owners of the country, fell down slain in battle, in defending their just rights:–terms of peace were offered, which they declare, they were forced to accept, it being a price very inadequate to its value. I do not mean by this, to arraign the government. The United States is a warlike nation;–and conquests made by the sword, are commonly applied to the account of the conquerors. So that in this view of things, it may be considered as an act of generosity in the government to pay the Indians twenty thousand dollars, for a country worth an hundred times that sum. But this wont do for thee nor me, who profess to be redeemed from the spirit of war, so as not even to buy a coat, if we know it to be a prize article. Thou may remember the concern brought on our Yearly Meeting by a few families of Friends in Virginia, who were settled on land not fairly bought of the Indians, and a sum of money was finally raised by Friends in Philadelphia, as a compensation, which had a good effect among the tribes. 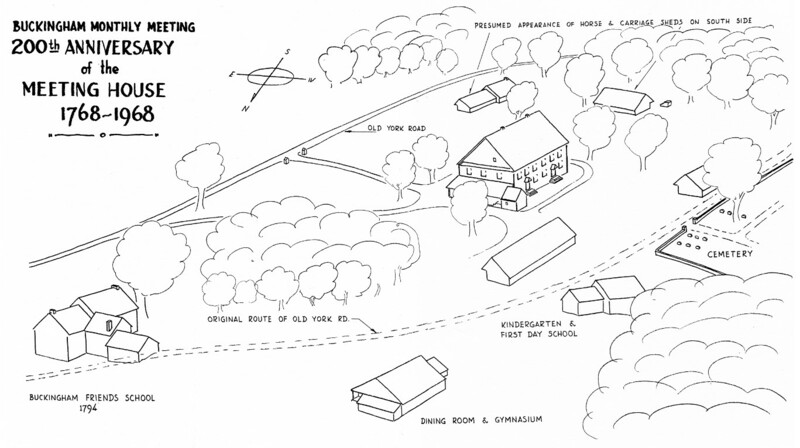 This map of the Solebury Friends Meeting graveyard was drafted in 1907, based on an earlier map from 1866. Unfortunately the 1866 map has suffered some damage and it’s difficult to make out most of the handwriting. 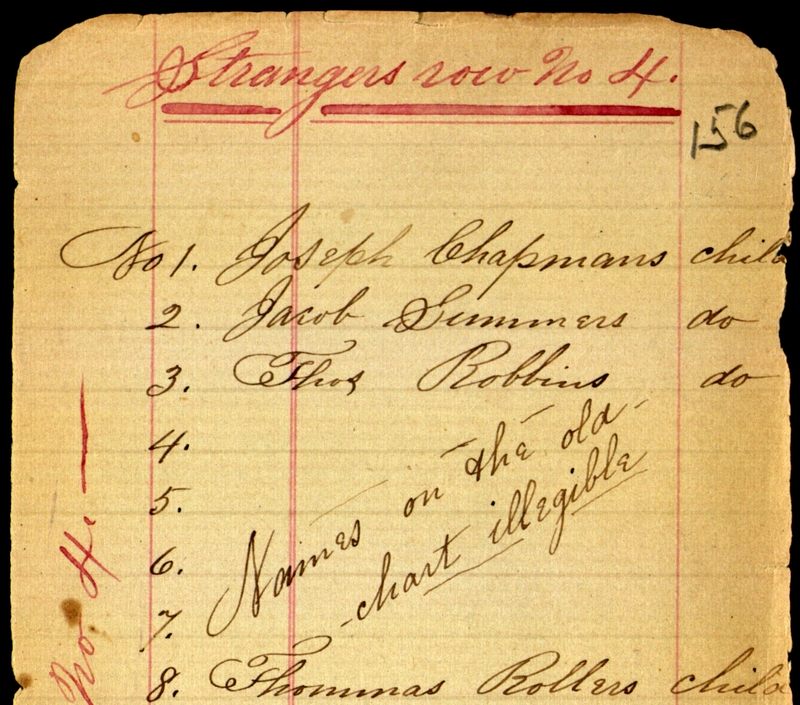 The handwriting matches that in the burial book in the Swarthmore archive, which also dates to 1866. 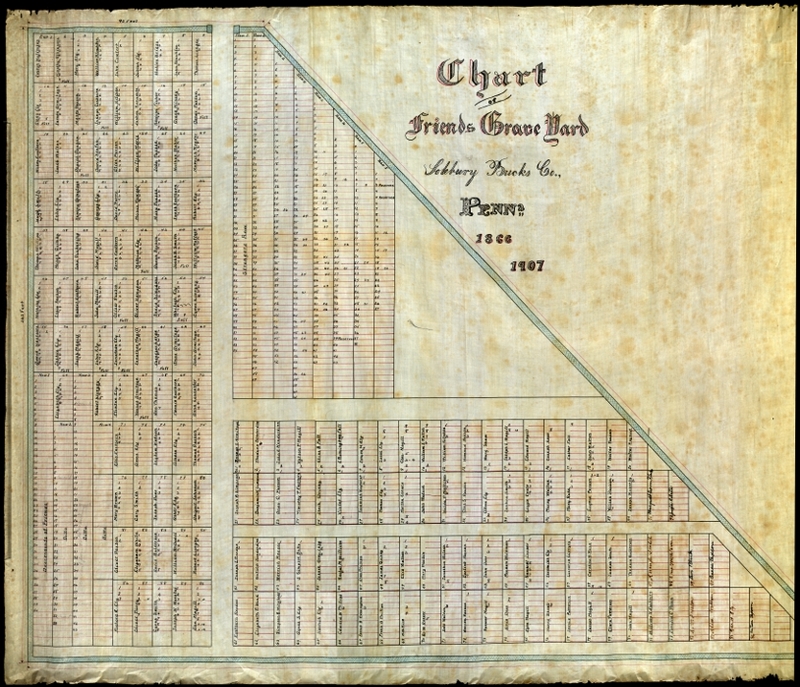 That book makes reference to a previous burial chart used as a reference for the 1866 map. It cites “extracts from the old chart” about decisions the meeting made about laying out the graveyard. There are also sections in the list of graves in which the writer of the 1866 book omits names, stating that they were illegible on the old chart. In all likelihood this original map no longer exists, and the names omitted on the 1866 map are probably lost forever. The 1866 and 1907 maps were almost lost as well. My great-grandfather used them as a reference when creating the modern burial map in the 1960s. Apparently he never returned the maps to the meeting, and I found them in a box of maps that had been stored in my family’s barn. I deposited them in the archive of the Friends Historical Library at Swarthmore College along with the rest of the meeting’s original records. While there, I used their excellent overhead scanner to digitize the maps. Click on the map above to see the full image. 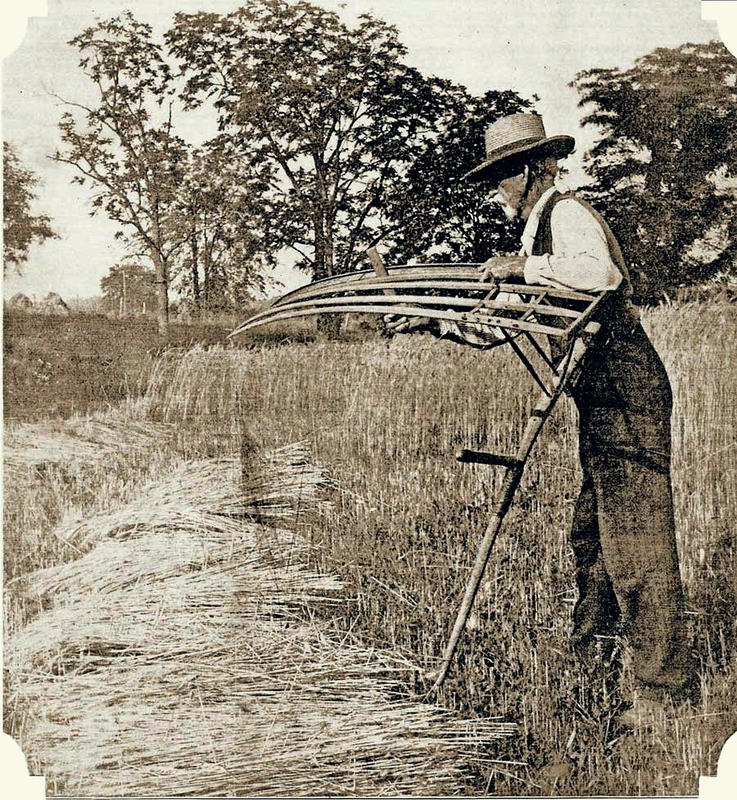 A man sharpens a cradle scythe, similar to Joseph Blundin’s murder weapon. Today a house sits on the southern corner of Court & East Streets, as nice and unremarkable as any other house in Doylestown. Few would guess that 177 years ago a murderer was buried here. Even fewer would guess that 157 years ago they dug him back up. 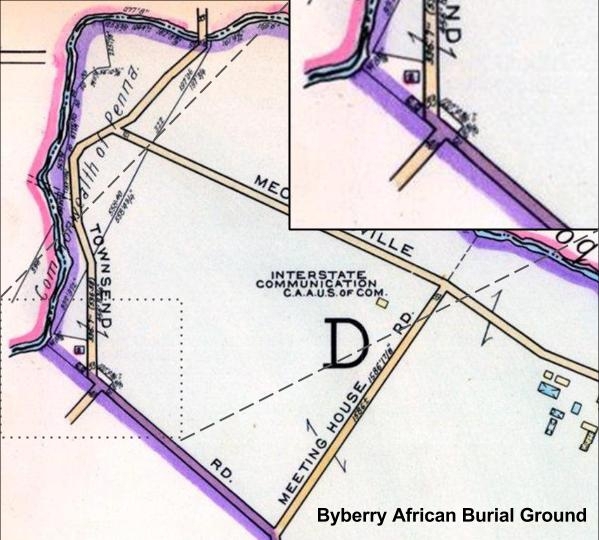 This is the story of the executed murderer Joseph Blundin and Doylestown’s forgotten burial ground. Joseph Blundin was a farmhand with a young family at the time of the crime. He appears on the 1830 US Census living in Bristol with his wife, both in their 20’s, and three children, all under 5 years old. The account of the crime and the public support for Blundin in its aftermath paint him as normal man driven by his circumstances to commit a horrendous act. 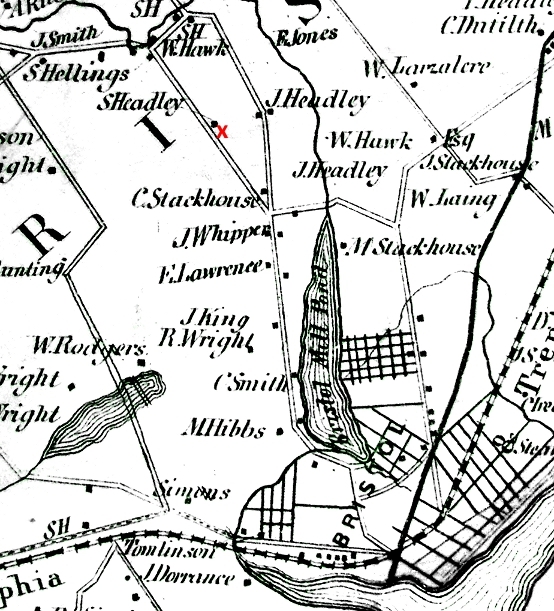 The murderer and victim were harvesting oats on the farm of Samuel Headly, probably the S. Headly marked with a red “X” on this map from 1857. The murder occurred somewhere on the road from Headly’s farm to Bristol. The prisoner and deceased were at work on Sunday, July 27th , with other men, five or six, engaged in cradling oats. At dinner one of the hands ran out of doors with a pie, deceased and the prisoner chasing him. In their playfulness a shoe was thrown which hit the prisoner. Shortly afterward the deceased came into the house crying, and said the prisoner had hit him on the head with a stone. This disturbance was settled, and they all went to the field to cradle oats. When nearly done a quarrel arose between the prisoner and the deceased, and the prisoner was thrown down and received several blows from [the] deceased in the face. The deceased with another then helped him upon his feet, and his knees giving way under him, they assisted him up a second time. The prisoner then took his cradle and started for home. He was asked to ride twice, but refused, and said, angrily, he would walk. From fifteen minutes to half an hour later he was overtaken by the wagon, walking slowly. He was asked to get up and ride. The prisoner made no reply, but raised his cradle from his shoulder and struck at the deceased hitting the cradle of the deceased, which he raised to guard the blow; the deceased at the same time losing his cradle from his hand, which fell upon the ground. The deceased (Cuttlehow) then sprang from the wagon to make his escape, but stumbled and fell as he reached the ground. When he had crawled a few paces the prisoner came upon him with his cradle uplifted and struck the scythe through the neck of Cuttlehow. The latter cried, “Take it out, take it out!” sank on the ground and died in one or two minutes. Some one said to the prisoner: “He will die,” who replied: “Let him die.” Liquor had been used in the field, but there was no satisfactory evidence that the prisoner was intoxicated. The jury was out eleven or twelve hours, and returned a verdict of murder in the first degree. We don’t know who started the fight, but it’s clear that the dead man had seriously beaten Blundin in the earlier scuffle, and that Blundin was emotionally distressed by the fight. Instead of escalating the conflict he attempted to walk home alone, only to be confronted again. After being pushed one last time by the other farmhands, he lashed out and killed Cuttlehow with the tool he happened to be carrying. All of this evidence portrays the crime as a temporary lapse by an otherwise decent man rather than the premeditated work of a cold-blooded killer. After he was sentenced to die by hanging, the public rose up in support of him. While the facts of the crime were not disputed, the death sentence issued seemed harsh and unnecessary. Battle reports that even Charles E. DuBois, the Deputy Attorney-General for the Commonwealth, “was overcome with emotion in reading the indictment to the unfortunate man.” The citizens of Bucks County appealed to the government for mercy, petitioning the Governor Goerge Wolfe and both houses of the State Assembly in an attempt to have his sentence commuted to life in prison. They attempted to save Blundin through multiple avenues, begging for the Governor and legislature to take action in his case specifically as well as attempting to change the state laws regarding criminal sentencing by giving the governor the power to commute death sentences to life in prison or by abolishing the death penalty altogether. Unfortunately, Blundin’s supporters failed in their attempts. Those opposed to the measures claimed that any action in his case was unconstitutional, either by violating the separation of powers or because such a law would affect one man instead of all people under their jurisdiction. Finally, after multiple stays of execution, Blundin was scheduled to die on Friday, August 14th, 1835 between noon and 3pm. On a Sunday in May Blundin attempted to make his escape from the jail. He managed to cut off the rivets of his hopples, burn a hole through the floor, and, after gaining the jail yard attempted by means of a rope formed of his bedding, to scale the outer wall. The fastenings gave way when the prisoner was near the top and he fell to the ground, where he lay in a bruised and helpless condition until found in the morning by the sheriff. Such was the sympathy of the public that a rumor that the sheriff left the means of escape within reach of the prisoner and then left the building to give him an opportunity to use them, obtained general credence and no marked disapproval. The unfortunate man was carried back to his cell and on the day appointed by the governor’s last respite was executed in the yard of the jail. The prisoner was unable to stand on account of his injuries, but he met his fate with resignation and courage. Then, by way of the gallows, Joseph Blundin found his temporary resting place in the now forgotten potter’s field. 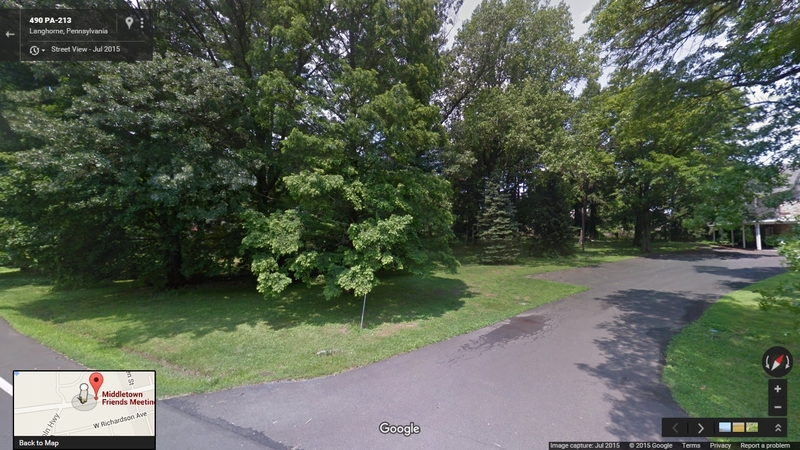 The old “potter’s field,” where several persons were buried, including one Blundin, of Bensalem [actually Bristol], hanged for murder about 1838, at the corner of Court and East streets was sold several years ago by authority of an act of Assembly and now belongs to a private owner. …it shall be the duty of the commissioners of the county of Bucks… to remove or cause to be removed to the burial ground of the Bucks county almshouse, the remains of all persons now interred in the public burial ground, situate at the corner of Court street and East street, in the borough of Doylestown, and known as Potter’s Field, and that the same shall no longer be used as a place of burial. The almshouse opened in the spring of 1810, and the first inmate to die there was a black woman named Dinah, allegedly 115 years old. According to almshouse records (List of Paupers in the Almshouse 1810-1833, p.31, available on microfilm at the Spruance Library), Dinah died on April 20th, 1810, and the almshouse supplied her with a “cape shirt hankercheif and coffin” for her burial. 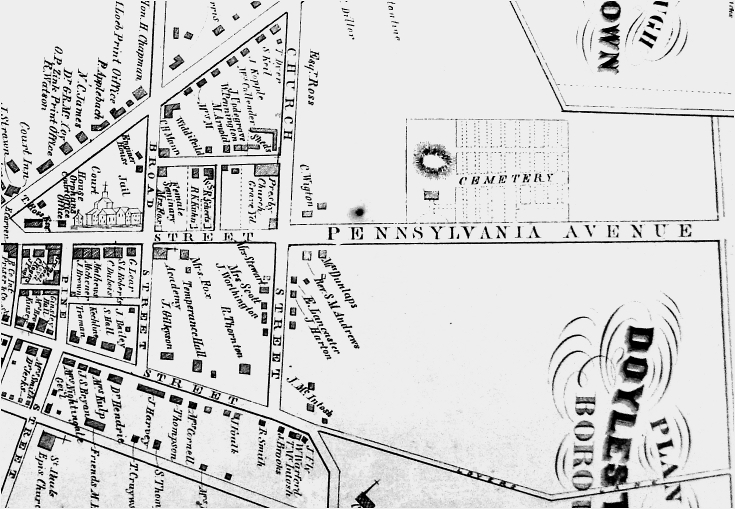 While I haven’t been able to find any information about the almshouse burial ground, it preceded the Doylestown potter’s field by at least a couple years and was probably used concurrently. At some point, the almshouse stopped using their own burial ground and began interring inmates at Doylestown Cemetery. I talked to Kat Landis, whose family oversees cemetery, and she said that the back row of the cemetery was laid out as a “Strangers Row” with inexpensive plots. According to her, this area became the burial ground for inmates from the almshouse, prisoners from the county jail, and people who died at the Doylestown hospital. This “back row” is now in the center of the cemetery near the main gate, since Hope Cemetery was added next to Doylestown Cemetery and the two were later unified. My guess is that when these cheap plots became available there was no more need for a government maintained burial ground. I have found some written evidence of this in the Almshouse and Hospital Register 1872-1889, which reports that inmate Henry Puff was buried at Doylestown Cemetary on the November 29th, 1883. Whether Joseph Blundin and the others buried in the potter’s field were actually disinterred may be up for debate. The graves in potter’s fields are usually unmarked, and the success of disinterment would depend on how systematically the graves were laid out and how well the locations were recorded. I’m sure they made their best effort to clear the land of bodies before selling it to a private owner, but after 20 years in the ground did the county remember the location of Blundin’s grave? He probably lies on the almshouse grounds, but every time I pass the old potter’s field I wonder if any graves remain. Springdale, Huffnagle, Rosenthal… Darkey Town? Segregated housing or unfortunate surname? Today while poring over J.D. Scott’s Combination Atlas Map of Bucks County (1876), I discovered this detail in the map of New Hope Borough. The row of houses on Stoney Hill Road above Joshua Whiteley’s cotton mill (now the Inn at the Ruins) is labelled Darkey Town. At different times the larger hamlet was known as Springdale, Huffnagle, and Rosenthal, but none of the sources I’ve checked make any mention of Darkey Town. MacReynolds’ Place Names in Bucks County provides some details about the development of the hamlet. Robert Heath built Solebury’s first grist mill here in 1707, and the William Maris moved here in 1812 and built the cotton mill (owned by Whiteley on this map) and the mansion known as Springdale. 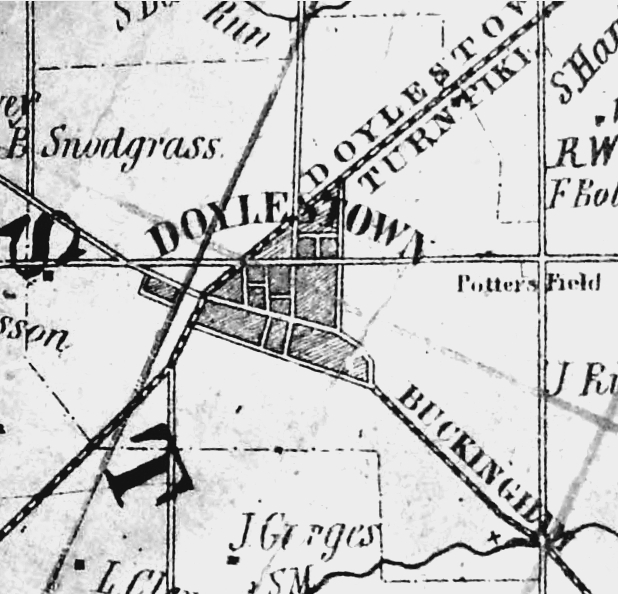 When the railroad line was put in, Springdale became first stop southwest of New Hope. 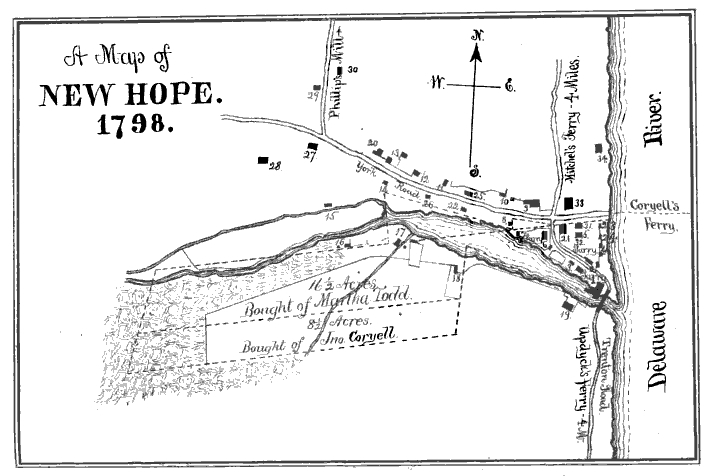 Maris sold the property to the Huffnagle family (Dr. John Huffnagle appears on this map). The hamlet was then called Huffnagle until it was renamed for artist Albert Rosenthal who purchased the ruined mansion in 1928 and set up a studio. The houses on Mechanics St. and Stoney Hill probably belonged to the skilled and unskilled laborers that worked at the mills. I hate to jump to conclusions, but of course I’m wondering if the name Darkey Town is being used in the pejorative sense to label a section of New Hope Borough where black families resided. There are two bits of evidence that reinforce this idea. First off, one of the residents is listed only as “Old Bob.” Every other resident I’ve found in this atlas is listed by surname or at very least by first and last initial (compare this to J. Huffnagle, M.D. a few houses to the west). Why was Old Bob not afforded the same respect and formality given to every other resident and landowner? More importantly, the building labelled “M.E. Ch.” may be a Methodist Episcopalian Church. This might be related to the Mount Gilead African Methodist Episcopalian Church, founded by former slaves on Buckingham Mountain in 1835. Of course, this hypothesis is discordant with the standard narrative of race relations in Bucks County. You always read that the area was remarkably tolerant thanks to the salutary influence of the Quakers. It’s conceivable that some less educated mill workers in this industrial valley had a different stance on race relations than the Quaker farmers. My biggest question is why this name doesn’t appear elsewhere. George MacReynolds was the librarian of the Bucks County Historical Society, so he must have seen this atlas. Did he omit this place name on purpose? This map was published in 1876, when minstrel shows were a popular source of entertainment and played a significant role in exporting the stereotypes of Southern racism to the rest of the country. A quick Google search reveals that the term “Darkey Town” was used in the South to describe black neighborhoods, such as this one on the outskirts of Lebanon, Virginia. By the time MacReynolds published Place Names in 1942 the name would have been downright offensive. Likewise, MacReynolds may have purposefully omitted it because the Darkey Town label was a spurious editorial flourish by the mapmaker rather than a name that locals actually used to describe that area. The next time I’m at the Spruance Library I’ll see what else I can find. If you enter Google Street View there are a few images of the ruins.